I haven’t made muffins in a couple of weeks, so it was about time I whipped up a batch. I added a few things into these muffins in hopes that they would fill Madeline up. She’s been a bottomless pit lately and is constantly hungry. I’m already noticing her pants getting shorter and shorter…hello, growth spurt. 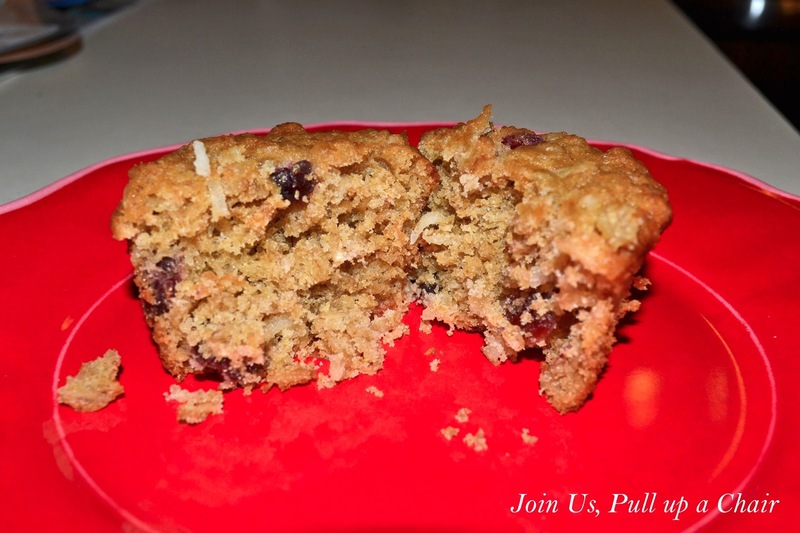 These muffins were a huge hit and she loved them. They were also a great snack for after dinner and for her to take for school. Preheat oven to 400 degrees. Line a muffin tin with paper liners and set aside. In a large bowl, whisk together the sour cream, milk, oil, vanilla, egg and brown sugar. Stir in the oats. In a separate bowl, mix together the remaining dry ingredients except for the cranberries and coconut. Combine the dry ingredients into the wet mixture. Stir just until combined. Fold in the cranberries and coconut. Divide the batter between the muffin cups, filling 2/3 way full. Bake for 15 to 18 minutes or until the tops are golden brown and a toothpick inserted in the center comes out clean. Place the tin on a wire rack and let cool for 5 minutes. Remove muffins from tin and cool completely on a wire rack.